Stimulating an ongoing debate about the importance of the African diaspora in founding the modern Iberian and Latin American nations, Miguel Ángel Rosales’s film Gurumbé: Afro-Andalusian Memories explores the subtle but certain interconnections between the music of Senegal, Portugal, Spain, and Mexico. 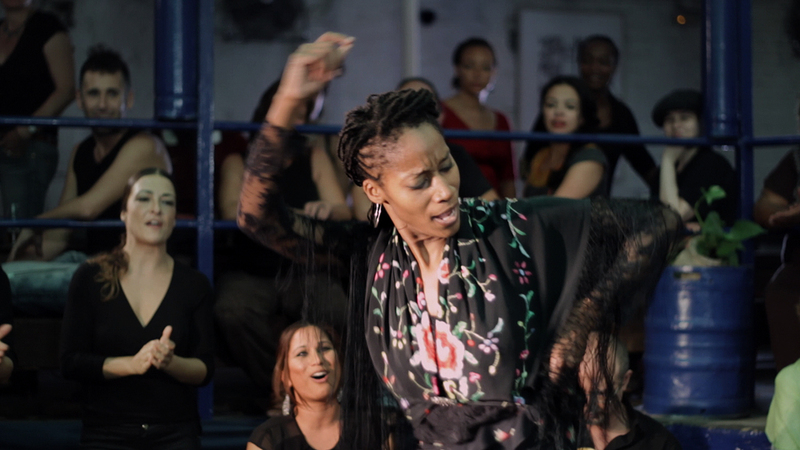 In traveling these countries, Rosales sheds new light on the oft-ignored influence of people of African descent on Flamenco, a music central to Spanish national identity. Following the film, acclaimed dancer Yinka Esi Graves will join Rosales in conversation. At 7pm in the Performance Penthouse, join us for a tablao, or flamenco show in which Graves will dance along to a performance by singer Alfonso Mougaburo and guitarist Guillermo Tarroux. Miguel Ángel Rosales earned degrees in anthropology and engineering before turning to the arts, studying music at the Conservatory of Granada and filmmaking at the Escuela Internacional de Cine y Televisión de Cuba (EICTV). He has scripted and directed documentaries in Spain and Cuba including La Maroma (2011), Atrapados al vuelo (2012), and Luz en los Márgenes (2013). Yinka Esi Graves is a British Flamenco dancer who studied at the world-renowned school Amor de Dios with artists such as La Lupi, Manuel Reyes, and Pepa Molina. Her dance explores the links between flamenco and other forms of expression. In 2014 Yinka co-founded dotdotdot dance. Devoted to engaging young people from different backgrounds in dance, she teaches regularly in London, Manchester, Seville, and Madrid. Presented by the Hispanic and Luso-Brazilian Student Committee, Department of Romance Languages and Literatures, Center for Latin American Studies, Film Studies Center, Department of Cinema and Media Studies, Department of Music, and the Logan Center for the Arts.